Oh boy. First of all I have to give you the major disclaimer: don’t do something potentially dangerous because some guy on the internet tells you to. Please, please evaluate your own situation before making a decision. Are we square? OK, then, let’s begin. If you rely on an outdoor antenna and you live in a cold climate then there’s a possibility that you’ll have icicles on your antenna. You might think they’re unsightly, but you really have a tough decision to make about whether or not to remove them. If they get heavy enough, icicles could weigh down a yagi antenna’s elements enough to bend or even break them, which ruins your investment. There is also the possibility that icicles by themselves could have a minor effect on reception by messing up your reception pattern or even attenuating the signal. On the other hand, going up on the roof in winter doesn’t seem terribly smart. Before you do anything, take a look to see if you think that there is really any need for action. 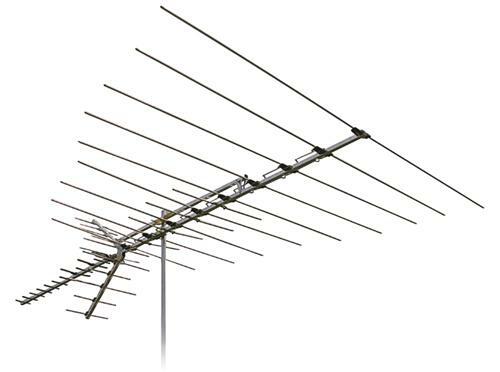 If there doesn’t seem to be any noticeable bending of the antenna and there doesn’t seem to be a reception problem then I wouldn’t go up there. I just wouldn’t. If you do think there’s a problem, for gosh sakes go up there carefully and get rid of those icicles with extreme care. A big icicle could actually be stronger than an antenna element, making removing them difficult. Take every possible precaution to first of all be safe and avoid slipping. Look, I’m just saying, you fall off the roof and nobody wins. A lot of people I know will start the season spraying their antennas with a little rain-X or even some non-stick cooking spray to keep the ice from sticking. That’s not a terrible idea but again, be careful and know that a little spray on an antenna goes a long way. Do not attempt to attach a dish heater or any other heating element to your antenna. There are generally plastic bits on an antenna that can melt easily, and it’s easy to short out the electronics in the balun and send current down the cable. Again, this is another “nobody wins” situation. I’d avoid having anything actively heating the antenna personally. Podcast #269: Why is 720p still a thing?